I got an email during the day asking about how to embed a Google Calendar (from our Google Apps system) as a sticky post in his WordPress blog. Unfortunately, I was not near my laptop (oh the horror). Fortunately, the staff member CC’d another of our top notch staff member and TCEA‘s Educator of the Year, Pam Cranford. The following is her reply. Yeah. It’s good to have awesome faculty. You can also find MANY other great presentations she made here. View more documents from Pam Cranford. $1000 TCEA Twitter Contest Begins! What’s your message? Many times educators may feel they’re alone on an island. 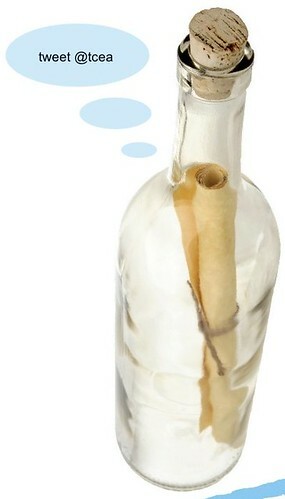 If you could place a message in a bottle to share with the world, what would it say? Who would you hope to receive it? Let the bottle become your vehicle to deliver your message. Message in a bottle should pertain to education (not limited to technology), the classroom, students, administration, funding, assessment, community, or technology. Freely express yourself and send us your message in a bottle. Messages will be narrowed down to the top picks and will be voted on by TCEA members. Winner will be announced at the TCEA 2010 Convention & Exposition in February, 2010. Contest ends January 8, 2010. Contest is not limited to TCEA members. Re-tweet us and invite your followers to submit their message. Note: TCEA board members and staff many not participate in contest. Voting will take place January 18-22. 2010, at www.tcea.org.